Back row: ?, Marie Pearson, ? Front row: ?, ? ,? Does anyone know the rest of the team, where and when? It looks like this was taken at the front of Dingwall Academy, possibly an inter school sports day or County sports. 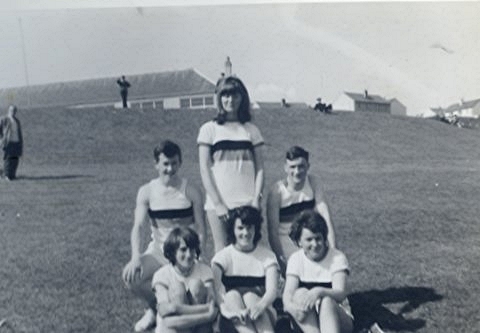 This might be Tain Royal Academy Athletics Team as my mum Jasmine Nicolson (front, centre) ran for both Tain and Invergordon and she seems to think that Marie Pearson ran for Tain too. Almost certain the young man to the right is Ian Allison which would make it an Invergordon team around 1966/7. This photograph was probably taken around June, 1964. You are correct with the date Marie. Do you know the names of the others in the photo? It is the Tain athletics team. Jimmy Mackay to the left of Marie Pearson and Donald Macleod on the right. I think is Mary Buchan on the left in the front row but not sure.